A fast, lightweight and easy social sharing plugin for WordPress made to increase your social shares. It’s free and packed with incredible features. Get more social media shares which can lead to more website traffic with the best free sharing plugin for WordPress! Social Revolution is lightweight, fast and comes with all you need to start growing your social shares. Are you looking for fast and attractive share buttons? Social Revolution is made by a team of professional WordPress developers. Social Revolution is fast, light and looks great on any resolution. Social Revolution will not slow down your site like other sharing plugins do. The Social Revolution share buttons are also privacy safe. They did not collect any user information to run. Need to change button size. We cover that too in the free version. You can set four different small or big sizes. Easy display how many times your content has been shared. Social shares display is a powerful psychological tool that has been proven to influence even more shares. We use the social network API endpoints to ensure that the most accurate share counts are always displayed. Get more social media shares which can lead to more website traffic with the best free sharing plugin for #WordPress! 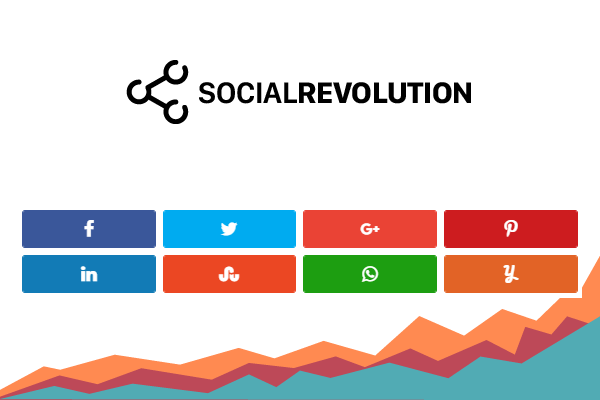 Social Revolution is lightweight, fast and comes with all you need. If you want to place buttons in the middle of an article, you can with our [ socialrevolution ] shortcode. What if you wanted to add share buttons to a page but actually have them share out a different page altogether? Social Revolution allows you to do this! If you’re experienced with PHP, you can also hook Social Revolution into your theme templates for hyper customization. Are you running an affiliate program on your site? Social Revolution comes with Affiliate WP support out of the box. Yes you receive a full feature support for free with the core plugin version – an unique option you will not find in other free plugins. Download Social Revolution for FREE and use it on unlimited number of sites. Social Revolution comes with automatic plugin updates too. Social share optimization tags for Facebook, Google, LinkedIn and etc. Download Social Revolution FreeBuy Social Revolution Pro Now!